It's popular to lament the end of summer, and I feel it too - there's something easy about summer, things seem less serious. But to me there's always something appealing with the start of fall. The air is fresh, the evenings get cosy and you can wrap yourself up in blankets and watch the rain falling outside. Or you can be outside and get rained upon, sometimes that really works. And, (bet you couldn't see this one coming) fall is the perfect season for porridge. Hearty, warming and full of taste. So welcome back after a long hot summer! We will be trying lots of new recipes and researching traditional ones. This season we're also hoping to check out some porridge recipes from different cultures and Linn-Sofie will be coming up with easy and healthy solutions for families with kids and precious little time and free hands. This sounds like a grand plan that will probably end up being a mix of everything in a more or less sensible order. Oh! And we're also bringing in some guest writers! If you have a great recipe that you want to share let us know! R and I celebrated the last days of summer holidays with a trip down to Snohomish, a sweet little town outside Seattle that specializes in antique stores. We tried very hard to distinguish just old stuff from very awesome design features and useful retro but I'm still not quite sure what kind we ended up bringing home... The picture above is from lunch found at the First and Union Kitchen. Pretty basic but well made from scratch and not too heavy on milk. 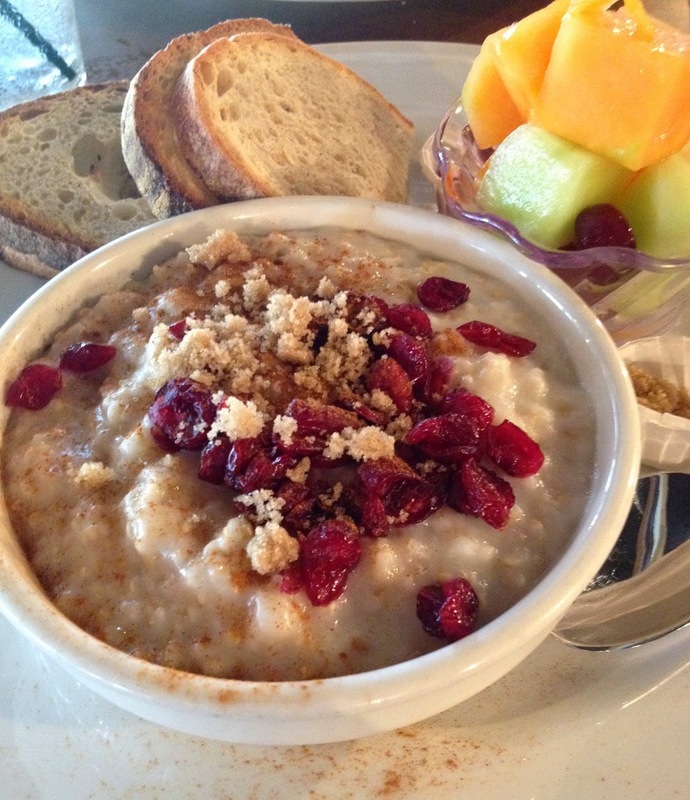 The oatmeal was served with dried cranberries and brown sugar, accompanied by some fresh fruit and jam on toast. Their pancakes are great too..